For schools in the Inland Northwest, change is coming in many forms. 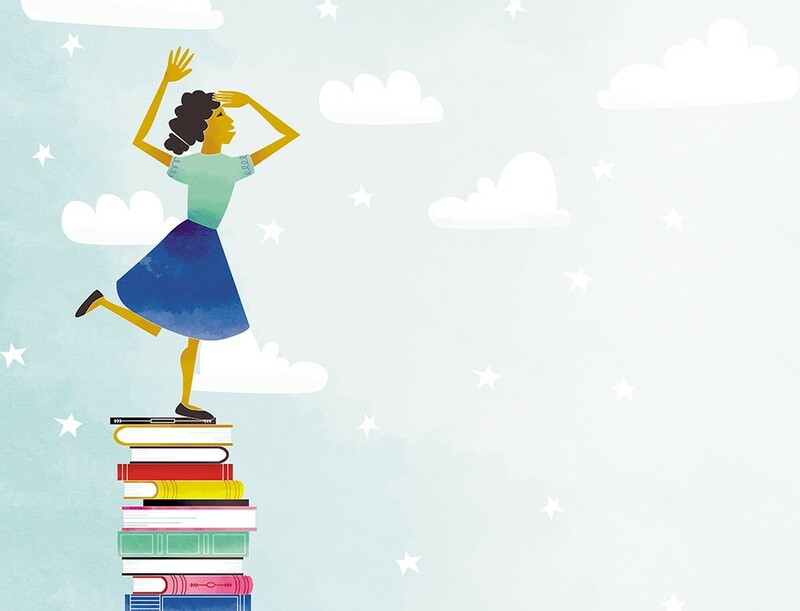 Whether it's newly constructed schools, redrawn boundaries, curriculum updates or ways to handle graduation requirements, school districts from Spokane to North Idaho all can expect to look a little bit different in the coming years. Here are some of the biggest changes ahead for Inland Northwest schools. Districts in Washington state have been scrambling to fulfill a mandated class-size reduction for grades K-3. Coupled with increased enrollment in Spokane-area schools, it's created a need for more schools — not only to accommodate the enrollment growth, but to lower class sizes. That's why Central Valley and Mead school districts went to voters with bond requests in February 2018. Both bonds won approval. Central Valley is now preparing to build a new high school — the region's first new high school since 1997. They will also add a new middle school and renovate Horizon Middle School. Mead will construct a new middle school and new elementary school in the coming years. Spokane Public Schools, meanwhile, passed a bond in 2015. While the district wasn't planning on asking for a new bond until 2021, space concerns have prompted the district to make major changes in its use of facilities. In June 2017, the district approved a plan to move the sixth grade from elementary school to middle school. The move is in line with what other districts in the state do, and it means Spokane won't have to build as many new elementary schools in response to space concerns. The change likely won't take place until 2021. In 2018, the district began a partnership with the city to look at a possible joint bond request in November. With middle schools adding a grade, the district is looking to build three new middle schools as soon as possible. The city has surplus property, and the two entities have been brainstorming ways to meet both of their needs. But the discussions have put the spotlight on Joe Albi Stadium in northwest Spokane. The district wants to downsize the stadium and put a new middle school on site. But the city prefers to demolish the stadium and build a new one downtown. Whatever is decided, expect Joe Albi to look a lot different in the coming years. 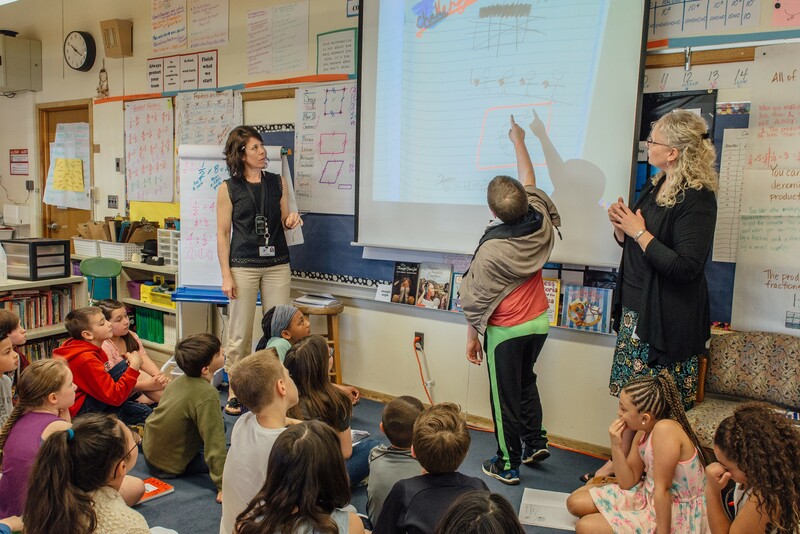 Franklin Elementary fourth- and fifth-grade teacher Beth O'Regan (left) during a math lesson. There are a couple reasons why school boundaries should be redrawn, including enrollment growth or the construction of new schools. Those are both situations Spokane and Central Valley schools find themselves in. In Spokane, a committee spent the 2017-18 school year studying priorities for new boundaries, considering the grade configuration and facility changes. Central Valley, too, has convened a committee to study how to revise all of its middle school boundaries in 2018 — not to mention the boundary changes when the new high school is built in the district. In North Idaho, it's not just enrollment growth causing changes to district boundaries, says Coeur d'Alene Public Schools spokesman Scott Maben. Rapid development in the area has caused confusion for families. "Homes are being built right up to and across the boundary line [separating Coeur d'Alene and Post Falls districts]," Maben says. "Some neighbors in the same boundary line ended up split between the two districts. One house even straddled the line — one half was in Coeur d'Alene, one half in Post Falls." The districts are hoping to redraw the boundary line to make Huetter Road the dividing point. Think back to the 1960s, 1970s and 1980s — when parents nowadays were in school learning math. The demand for jobs requiring proficiency in science, technology, engineering and math (STEM) was nowhere close to the demand for those jobs now. "We need more of those students to take those jobs on," says Matthew Henshaw, director of elementary curriculum for Spokane Public Schools. And colleges don't just want people who can calculate equations in their head — calculators can do that. "They want thinkers," Henshaw says. "If I'm an engineer or computer scientist, I have to problem solve and have that full package." That's why Spokane is rolling out new math curriculum for grades K-10 in the next couple years. The new teaching aims to allow kids to use their own thinking and understand problems as they solve them. And Spokane isn't the only district rethinking math. 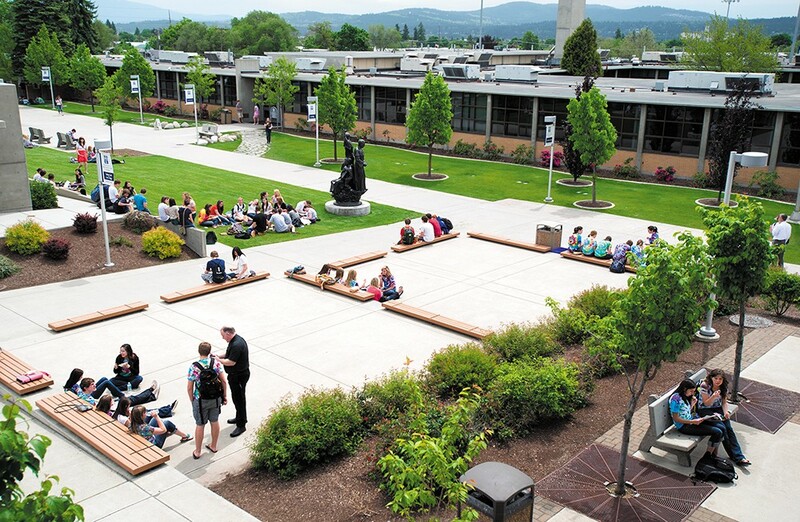 Coeur d'Alene Public Schools, too, will toss out its old way of teaching math in high school. Instead, the district will opt for an "integrated" math approach, combining subjects like algebra and geometry into the same course. "We are completely re-organizing how we teach math at the high school level," Maben says. "It's a big change for us." Since 2014, Spokane Public Schools has delayed a rule that says high school students must earn 24 credits to graduate, which was set by the Washington State Board of Education. But for the class of 2021, the requirement is now upon them: Those students must take six class periods every single day for all four years of high school. To earn 24 credits, they must pass every single one. But last year, the Inlander reported that nearly a quarter of high school freshman in Spokane Public Schools failed at least one class their first semester, already putting them at risk of not graduating. It's left Spokane Public Schools with a difficult decision: Either change the entire school schedule to fit more classes in a year, as other districts across the state have done in response to the 24-credit requirement; or keep the schedule the same, making more of an effort to provide support to students before they fail a course. So far, the district has chosen the latter. But the district has been keeping other options on the table, such as switching to a seven-period day. "That's been one of the things we've been discussing," says Shawn Jordan, Spokane's director of secondary curriculum. "That could be a decision we make." While many of these private schools have preschools and other programs, this listing focuses on K-12. The information was provided by the schools. The original print version of this article was headlined "Seeing The Future"